Everyone always asks me, “You own a home, but you still live with your parents?” And every time, I answer with, “Well, I get a ride to work every day from my mom and my dad has a gourmet meal on the table when I come home.” I know it sounds awfully spoiled, but that’s how it is in the Lee family household. To be fair, I’m living at my home part-time. But seriously, would you leave if you had food like this, this and this? Last week, my dad got a whole fresh red snapper from Costco. And now that he’s discovered the internet, he just loves scouring the web for new recipes. Most of the recipes he found were boring to him because they use the same ol’ ingredients – lemon, dill, olive oil, etc. 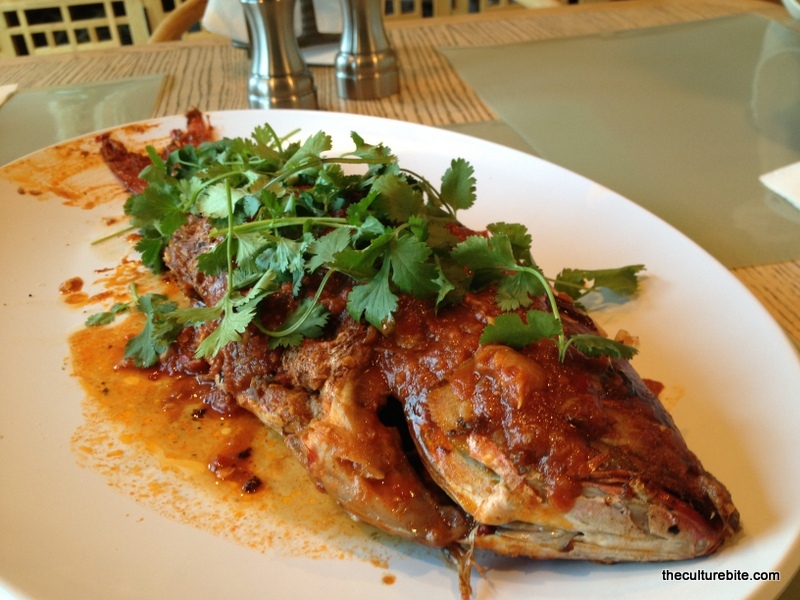 He decided to search for “red snapper Chinese style” and came across this recipe. It was different and spicy, so he decided to give it a shot. Rub the fish with soy sauce and dry wine mixture. Let the fish fillets marinated in the refrigerator for about 15 minutes. Heat oil in a large skillet, saute the fish fillets for about 3 minutes on each side. Remove the fillets, add garlic, green onion, ginger, chili bean sauce, tomato paste, sugar, vinegar and water. Bring the mixture to a boil before adding the fish fillets back to the skillet. Braise the fish in the sauce for about 4 to 5 minutes. Mix the cornstarch with 2 tsp of water, stir in the sauce and cook for another minute. Sprinkle with sesame oil (optional) and serve immediately with steamed rice and your favorite steamed vegetables. 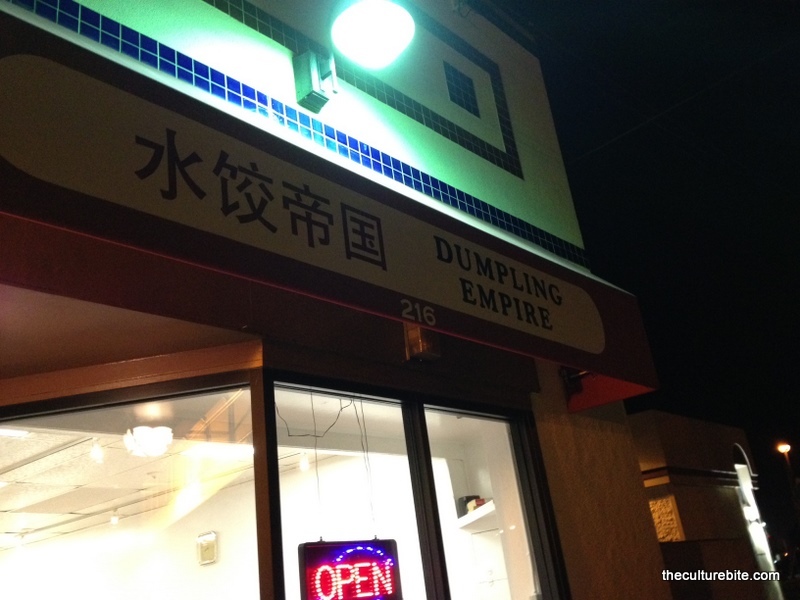 I’m a tad big conflicted with Dumpling Empire. If you’ve been here and to Kingdom of Dumpling in San Francisco, you’ll know why. The similarities to both restaurants are uncanny. They practically have the same menu (like, same items in the exact same order) with the same dumplings and the same delicious homemade hot sauce. Both restaurants have to be related somehow, right? Wrong. I asked the waitress at Dumpling Empire if they were the same restaurant as Kingdom of Dumpling on Taraval St. and she quickly responded with a simple “no.” The only difference, which is a big one, is the wait. There is none! And with all moral conflicts aside, Dumpling Empire is now one of my new favorite dumpling joints. I order my usual – pork with napa cabbage dumplings, lamb with vegetables dumplings, lamb skewers and pan fried soup dumpling. 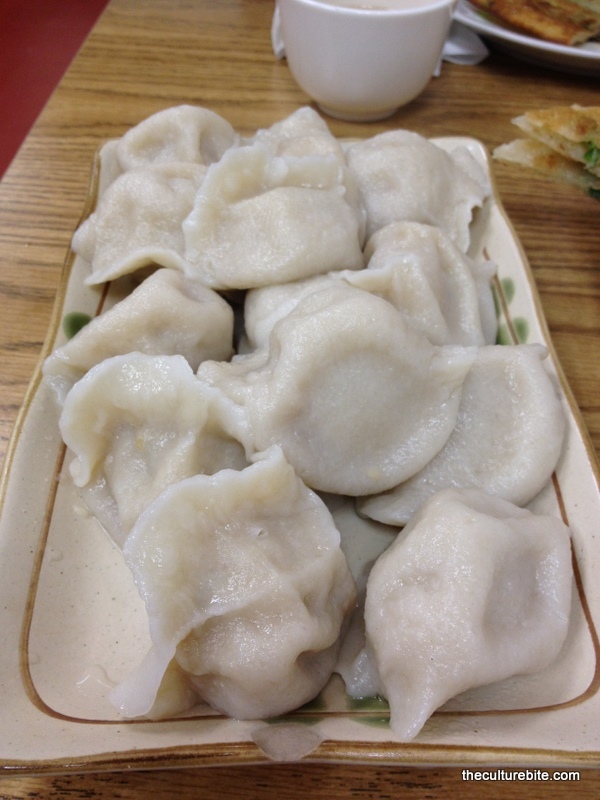 The pork and lamb dumplings are succulent and tender. Dip these juicy pillows in their house hot sauce and you’re in for a treat. That sauce is painfully hot, but I can’t stop myself from pouring it all over my plate. 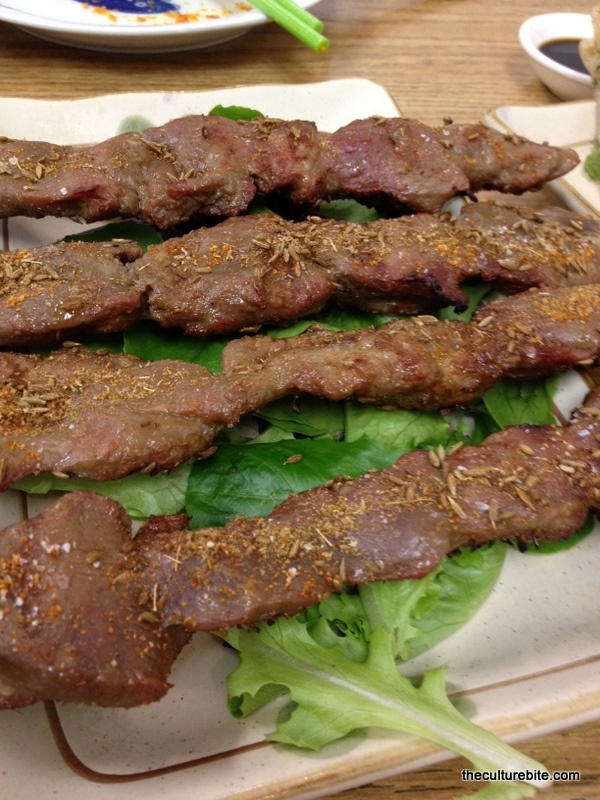 The lamb skewers are perfect. 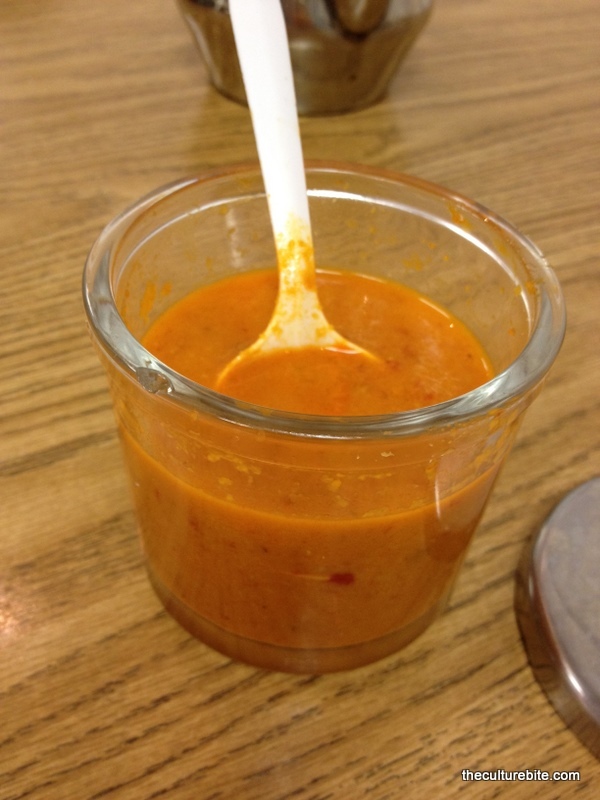 Seasoned with generous amounts of cumin and hot sauce, this is one Shanghainese street food item I can’t live without. I actually prefer the pan fried soup dumplings over the traditional soup dumplings at Dumpling Empire. These dumplings are filled with soup and has a thin breaded wrapper. Because they are pan fried, they are crispy at the bottom and soft on the top. So, who will reign supreme in this battle between the kingdom and empire? I love them both, but I am willing to drive the extra 15 minutes out of the way to Dumpling Empire to get an immediate table. However, Kingdom of Dumpling will remain my #1 go-to take out place. My understanding of the Chinese language consists of ordering dim sum and counting to number ninety-nine. I’ve never learned how to say one-hundred. But that’s okay, these two things are all I need to know. Being a Chinese-American and from San Francisco, I’ve been eating dim sum all my life. Eating dim sum, or yum cha, is not just the act of consuming miniature-sized food. We talk, we eat, we share. It’s an event where family and friends get together to share an experience. One of my pet peeves is sitting at a Chinese restaurant and watching people order the wrong things. No, walnut prawns is not a dim sum dish. Stop ordering that during dim sum. It’s deep fried and soaked in mayo and that’s just a terrible thing to eat for a meal that’s supposed to be breakfast. So, I’m writing this post to share with you what I enjoy eating during at a dim sum restaurant. Cherng Fun with Beef – My dim sum experience isn’t complete until I have this dish. Soft thin sheets of rice noodles are wrapped around really tender ground beef and topped with a light, sweet soy sauce. Siu Mai (or Shumai – Pork Dumplings) – If you look around at all the tables with Chinese people, you’ll find this on every table. It’s a classic dim sum dish. Think of it like a pork and mushroom meatball wrapped in a won ton wrapper. Not my top choice of dim sum dishes at most restaurants, but I will almost always get it at Yank Sing. It’s super good there. Har Gow (Shrimp Dumpligs) – Like Siu Mai, this is another classic dish. This shrimp dumpling is wrapped with a translucent, chewy wrapper made from tapioca powder. Dunk these in hot sauce and you’re golden. Lo Bak Goh (Turnip Cake) – I love this stuff! Similar to potato pancakes, these are made with rice flour and sliced turnips. Soft and gooey on the inside and crispy on the outside. Lo Mai Gai (Sticky Rice) – Wrapped in banana leaves, these soft, sticky rice balls are filled with mushrooms, Chinese sausage and pork. If you’re not full from the little dumplings, order this dish. It’ll fill you up. Fung Jow (Chicken Feet) – I know, the thought of eating chicken feet is just disgusting, but trust me, it’s good. These little brown feet are deep fried then braised in a sweet, ginger sauce. Ngau Tou (Steamed Tripe) – Don’t confuse this with the brown sponge-like tripe. These thin strips of white tripe are crunchy in texture. The tripe itself is tasteless, but it’s steamed in a light ginger broth. Guk Bao (Baked Char Siu Bao) – This barbecue pork bun is baked golden brown with a sweet glaze on top. From experience, all children love these. Jin Deui (Sesame Balls) – Sesame balls are chewy, crispy balls made from glutinous rice flour tolled in sesame seeds and filled with lotus bean paste. The best ones I’ve ever had are from Yank Sing Restaurant in San Francisco. Trick is to ask for fresh ones so that they’re still warm and soft from the oven. Mango Pudding – I could eat mango pudding all day. The best kinds are rich, creamy and loaded with chunks of mangoes. Dan Tat (Egg Tart) – Egg Tarts are like mini egg custard pies. Light, crispy crust filled with a silky smooth egg custard. So good! So, there’s my list of favorite dim sum dishes. Also, everything tastes better with hot sauce. My favorite is the chili sauce from Yank Sing. I usually unload a whole bottle in one sitting!